The first Golf GTI was introduced in 1976, with a 1.6l 110hp engine. Thus was born the hot hatch, a car that is both sensible and fun to drive. For the last production year, the engine displacement was raised to 1.8l. It was followed by the Golf II GTI introduced in 1984. Engine displacement was retained at 1.8l, but a sixteen-valve version with more power (129hp with, 139hp without catalytic converter) became available. Towards the end of the production run, the 160hp G60 engine (as used in the Corrado and the Rallye Golf) was also available. The Golf III GTI was introduced in 1991. Engine displacement was increased to 2.0l, power to 115hp (eight-valve) and 150hp (sixteen-valve). But the GTI was no longer the most powerful Golf, as the 174hp VR6 engine was also available in the Golf III. The GTI moniker was further devaluated with the introduction of the Golf IV in 1997. This model was essentially a trim line, available with a larger variety of engines including Diesels. At 150hp, the 1.8T did not exceed the power of the Golf III GTI 16v. This was rectified in 2001, when a 180hp version of the same engine became available. The most powerful Golf IV was the R32 with four-wheel drive and 241hp. The introduction of the Golf V in 2003 saw a return to old GTI values. It received distinguishing design features and a 200hp 2.0l TFSI (turbocharged direct fuel injected) engine. For the 30th anniversary model, power was further increased to 230hp. The most powerful Golf V was once again the R32, now with a 250hp engine. The Golf V was not as succesfull as its predecessors, leading to a short production run of only five years. The Golf VI is essentially a revised Golf V, an interim model designed to fill the gap until a completely new model became available. 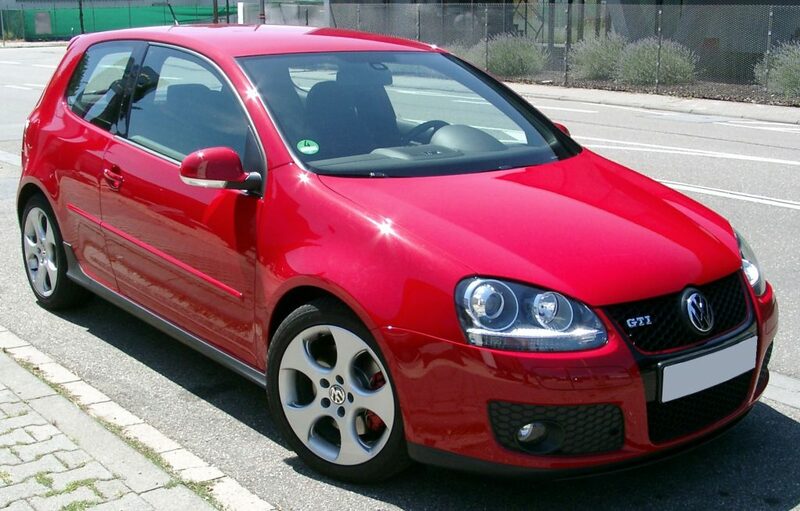 The GTI was introduced in early 2009, with the 2.0l engine now developing 211hp (235hp in the 35th anniversary model). The most powerful Golf was the R, which lost the six-cylinder and instead went to a more powerful (270hp) version of the GTI engine, but retained the four-wheel drive. The Golf VII was introduced in late 2012, with the GTI following in 2013. Once again, all performance models share the same basic 2.0l turbo-charged engine. Power ranges from 220hp for the base GTI up to 2017, up to 310hp for the R. Other quick options are the 184hp GTD (which has more torque than the GTI) and the hybrid GTE, which was very popular in the Netherlands for some time for tax reasons. 40 years of development have of course resulted in a performance increase, with the Golf VII GTI having twice the power of the first model. Weight has of course increased, too. A Golf 1 GTI did 0-100 kph in around 10s with a top speed near 180 kph. A Golf VII GTI needs 6.4s with a top speed limited to 250kph. The other models are somewhere in between. The current R model does 0-100 kph in less than 5s (helped not only by more power, but also by four-wheel drive). The original hot hatch. Has always offered a good compromise between practicality and driving pleasure. Renowned for quality and reliability. Older eight-valve models aren’t that powerful, while already being quite expensive. Some models, especially the Golf IV GTI, are a bit bland. Front-wheel drive. For nostalgic reasons (my first car was a Golf II) the Golf II GTI 16v. But if you’re in search of power, from the Golf V GTI onwards is where you want to be.